Real Grade Sinanju Box Art & Release Date!! So one of the most anticipated Gunpla to release this year is coming out incredibly soon! The Real Grade Sinanju! With actual plated gold parts, articulation, and amazing detail that we haven’t seen since the MG. The Real Grade Sinanju looks to be an amazing addition to the RG line. I have paid for this kit ever since it went up for preorder. Which leads me to the release date! According to a few sources, including Gundam Kits Collection, have indicated that the kit comes out on August 4th which is this Thursday in Japan! I hope to get a shipping notice on Wednesday afternoon or night (US time) since Japan is around 15 hours ahead of the eastern US. 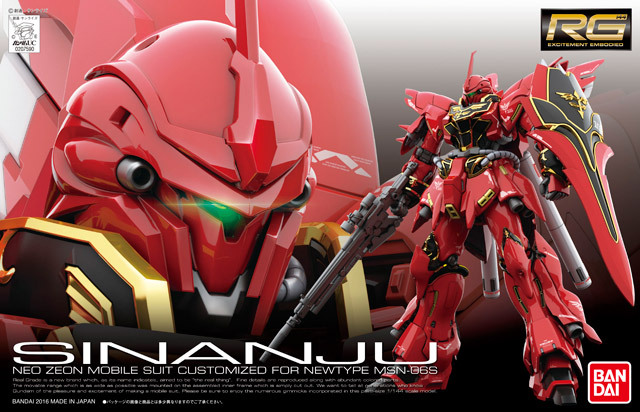 Now here is pretty much what you all clicked on this article to see…the box art for the Real Grade Sinanju! The box art is your standard Real Grade box art but really they never cease to amaze me on how well all the mobile suits look in this type of art style. It truly catches your eye and really makes you want to buy the kit. Sorry for the lack on content, but since I do this on my free time…I haven’t had much of that recently…A lot of content on the back end is coming that I have been working on so stay tuned! So who among you is get this kit right away? Who isn’t? Let me know in the comments either way and why you decided on it!! Keep Building and Keep Playing! Previous story RG Sinanju New CLOSE UP IMAGES and Release Info!